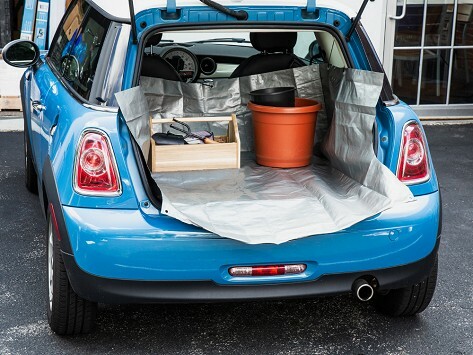 Protect your car's interior with this trunk liner that keeps all of the cargo area—floor, walls, and the backs of the seats—covered. Durable, waterproof, and tear-proof, the liner fits into the trunk space of most hatchback cars and SUVs and there are sizes to suit different models. A suspension hanging system makes it easy to install and just as easy to take down between jobs. Dimensions: Small: 34" x 42" x 15"; Medium: 56" x 42" x 15"; Large: 73" x 42" x 15"; XL: 96" x 48" x 15"
Weight: Small: 1.5 lbs. ; Medium: 1.6 lbs. ; Large: 1.8 lbs. ; XL: 3 lbs. Great when you need to use your car as a pickup. Fits great and saves so much time cleaning the car. We use it to transport the animals to the vet. When we first saw this trunk liner, we immediately came up with a million and one ways we would use it. Whether you’re carting dirty dogs, sandy beach chairs, bags of mulch, muddy bikes and much more, CarGo Apron keeps your trunk fully protected. There are sizes that fit just about any hatchback car and SUV. The liner is made from an ultra-durable tear-proof and waterproof material that covers the entire space—like up the sides and the back of the seats, not just the floor. There’s a lip that shields the bumper, too. Maker Chip McAuliffe had a new SUV he was trying to keep nice and clean, despite the dirty jobs he needed to do. He created CarGo Apron to act as a protective layer that fits kind of like a box inside a trunk. A suspension hanging system makes the liner easy to install, and just as easy to roll up and stow away when the dirty work is done.